Chickpeas, or garbanzo beans, are full of good-ness. They are full of protein, fiber and folic acid. 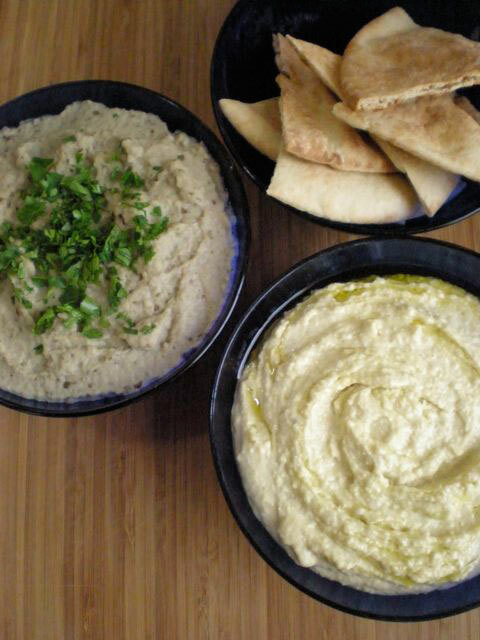 Hummus is a satisfying healthy snack (and low in calories!) While it is a cinch to use canned beans, using dried beans really tastes amazing. A handful of beans goes a long way. Traditionally, you grind up the chickpeas through a food mill, but as we don't have one, the food processor works just as well (for us). It was my 9-year-old daughter who provided the the key to creaminess that you get in the store-bought tubs of hummus -- a bit of water! Rinse chickpeas and discard any broken or discolored ones. Soak for 4-8 hours, or overnight, in plenty of water with the baking soda. Drain and rinse well, place chickpeas in a saucepan, fill with enough water to cover by 1" (3cm) and add 1 tsp salt. Bring to a boil, scoop out all the frothy foam that rises to the surface. Reduce heat and simmer for 30 minutes. Drain and let cool completely. In a food processor, blend the prepared chickpeas, garlic, tahini, cumin, salt, and pepper. Process until smooth. Gradually add the water, spoonful by spoonful, and blend until the desired consistency. You may not use all the water, as it may get too runny. Try a small dab and adjust flavors as necessary, by adding more olive oil, cumin, salt or lemon juice to taste. Spoon into serving bowl/dish. Cover and refrigerate until ready to serve. Add olive oil on top and garnish with a few parsley leaves and a sprinkle of paprika around the outer edges. Serve with warmed pita bread or crisp carrot sticks. Using the tines of a fork, stab the eggplant all over at least a dozen times. Put the garlic cloves in the same baking tray. Broil on “hi” for 45 minutes to one hour, turning several times for even heat distribution. Let cool, then cut the eggplant in half lengthwise and scoop out the soft insides. Pop the garlic out of the skins. Using a fork or wooden spatula, smash the eggplant pulp with the garlic, tahini, salt and lemon juice. Don’t use any electrical appliances for this. Cover and chill in the refrigerator. Just before serving, drizzle with olive oil and garnish with fresh parsley leaves. A friend told me about your website so I've been following it for a while. Not a good cook, but finally inspired to try something that seemed manageable. We buy a lot of hummus from the store so thought I'd try your homemade recipe. SOOO yummy and so easy. My son is only 2 and a half years old and loved the babaganoush (or maybe he just liked saying it, haha). Anyway, thanks for sharing. The recipes were delish.